Primary Natural Resources building stone, wheat, grapes, corn. SAN MARINO IS one of Europe’s five microstates. Like the others, it is a holdover from a more fragmented European past. San Marino differs from these, however, in its claims to be the world’s oldest existing republic, having never had a ruling royal family (like MONACO or LIECHTENSTEIN), looking back instead on nearly a thousand years of communal governance, and a democratic constitution written in 1601. The country consists of one town and smaller settlements clustered around Mount Titano, one of the peaks of the Apennine mountains, not too far from the coast of the ADRIATIC SEA. The town formed around a monastery founded, according to local tradition, by a Christian stonemason named Marinus in 301 C.E. He and his followers were fleeing religious persecution from Roman authorities in Rimini and set up their own community which maintained its independence and isolation across the centuries. The mountain refuge served as a political asylum during the upheavals of Italian unification in the 19th century, sheltering the famous patriot, Giuseppe Garibaldi. 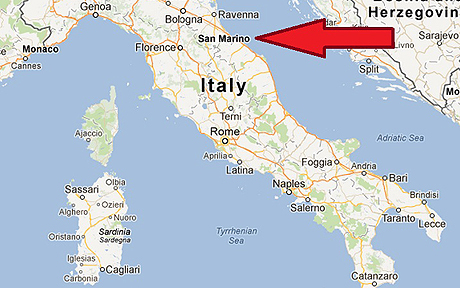 In thanks for this aid, the new Italian government promised in 1862 to respect San Marino’s independence. In practical terms, however, modern San Marino is dominated politically, culturally, and economically by ITALY, which surrounds it on all sides. Nominal independence continues to give the country advantages, however, as a tax haven within the borders of the EUROPEAN UNION. Locals guard this independence, even more so in recent years. San Marino has recently started to send its own separate delegation of athletes to the Olympic Games and formally joined the United Nations in 1992. About 20,000 Sanmarinese live in Italy or abroad, but they retain their identity, and the government even pays for them to return home for elections. Tax evasion is a bone of contention with the EUROPEAN UNION (EU), and the subject of recent agreements between the EU government and the microstates of Europe. The republic is only 8 mi (13 km) at its greatest length, and completely dominated by its mountain, crowned by three summits, each with fortifications. Four villages nestle in valleys descending from the mountain, surrounded by what little agricultural flatland there is, where wheat, grapes and some livestock are raised. There is also some light manufacturing, producing cotton textiles, brick and tile, and pottery that is sold in countless tourist stands. It has been estimated that there are more tourist shops per capita than anywhere else in the world. Tourists and stamp collectors generate a significant amount of revenue: more than 50 percent of the GDP in 2000, generated by over 3 million visitors.